Print newspapers are disappearing left and right. Business models are being revamped for the digital era. Digihipsters and change addicts are hailing the death of print. What is the reason behind the long decline of print subscriptions? The internet, of course, but why? I understand the multimedia possibilities internet publications have. Videos, slide shows and interactive content could offer much additional value for articles. The volume of information is on a different planet compared to print, you can basically carry a whole library with you if you have a proper device. To maximize the value for time used reading, the last few years have seen a wave of start ups creating different applications for perfecting content flow according to your preferences. I opted to subscribe to print Helsingin Sanomat after reading the iPad version for a year, because I noticed that I only read the headlines. My reading habits deteriorated because the reading experience so poor on the small screen. No matter how fancy the effects are (Edge), or how nice the layout is (Polygon), print is superior for pure reading. Reading from 24″ screen is awkward and too straining to be enjoyed for longer periods of time. And look at the picture again, how can you offer anything resembling a good reading experience on a frame as small as that? I’m somewhat taken aback by the way people trash print. 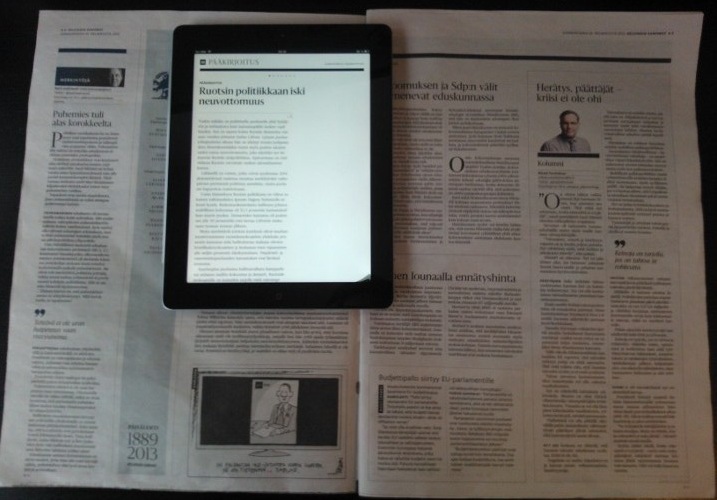 How do you read newspapers for example on a tablet? By meticulously reading every article, or by reading the headlines only? I like to skim through, glance left and right, skip some articles and come back to them shortly after. I find this extremely difficult to do with the tablet UI’s of today. Moping aside, I of course also enjoy my daily dosage of digital magazines and newspapers, but please, there’s still plenty of room and reason for print to exist.